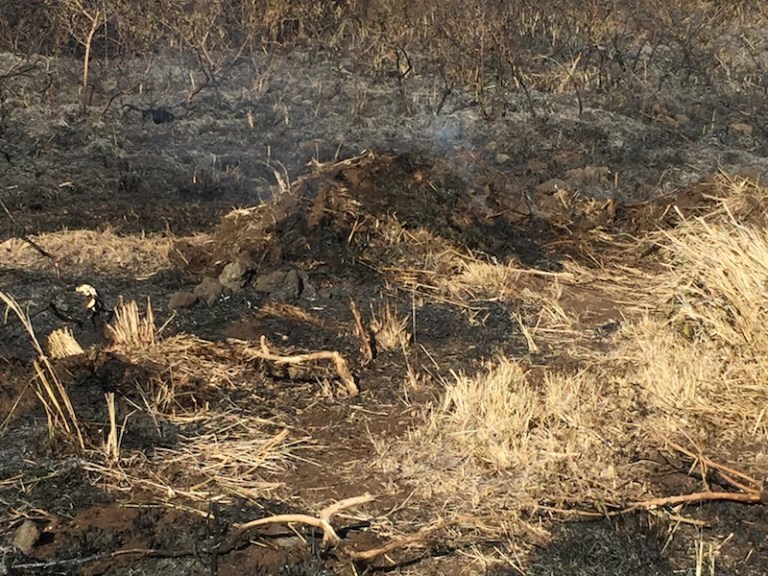 This guest post was written by Michelle Galimba, a rancher in Ka'u on the Big Island, and describes the fire which started on Sept. 21st in her family's pasture lands. It originally appeared on her blog on Sept. 27, 2017 and is reposted here with her permission. In the last three days a wildfire has turned 800 acres of pasture on our ranch to black. It was a very dry pasture with very dry feed, hence the wildfire, but still it was good feed, like standing grass hay. These fires happen periodically when it gets dry. Every ranch around here gets their turn at this and it is no cause for despair. But it is a painful blow to lose so much feed for our cattle when we are in a Stage Two Drought and there is no predicting the weather-patterns anymore. I don’t know how the fire started. Probably a careless fisherman tossing away a cigarette into a clump of dry grass as he crossed our pasture on the way to or from the ocean. Maybe it was started deliberately by a local “firebug” – a person that likes to start and watch fires. It doesn’t really matter how it started. What matters is that once it got started it was almost unstoppable. To the right is a photo from the first night, when it had burned all day and eaten up about 200 acres. This is just before a bulldozer got in to cut a firebreak – a line where the brush has been scraped off, depriving the fire of fuel. When the firebreak was done the line of flames died out and it seemed we had the fire stopped. But that was a vain hope. The next day the wind picked up and the embers that had been smoldering “in the black” leapt to life, crossed over the firebreak and consumed 500 acres between 9 am and 1 pm. More firebreaks were made and again as the wind died at dusk the flames stopped at the newly made firebreaks. But there were smoldering piles waiting all along the line. The next morning I decided to get to know this fire personally. I have to admit that this is the first wildfire that I’ve taken the time to get to know face-to-face, one-on-one. During all the previous fires I’ve stayed distant while my father or brother got involved in assisting (and sometimes surreptitiously directing) the fire-fighting effort. But for this one I decided I needed, finally, to try to understand what was happening. Why was this fire defying the efforts of a half-dozen fire-crews and two helicopters? How could it keep leaping the firebreak even though it was a back-burn i.e. burning against the wind? What is the most effective way to fight a range wild-fire? So I went down to the fire-line early before the wind picked up, before anyone else was there and watched the fire. I didn’t bring any equipment to fight the fire. I just wanted to be there with it for a while, to see it up close, rather than watching it from a distance or running around reacting to it or talking about it with other people. Everything was black on the far side of the firebreak, white smoke streaming in tiny wisps from single blades of grass, or billowing extravagantly from half-burnt piles of debris that the bulldozer had pushed to the side. A little way into the black orange flames burned in a pile of wood at the base of a brush tree. I stopped there looking at this few hundred feet of the fire-line on this, the back-burn end of the fire. What amazed me was that the dirt seemed to be quietly on fire, reaching by slow black inexorable fingers across the fire-break. I stuck the toe of my boot into the hot, black dirt and discovered that it was a root that was burning, the underground root of a clump of grass that had already been incinerated, and that burning root had blackened the dirt all around it. Even with no fuel for it above ground the fire was slowly crossing the fire-break. The sun shone hot on the dark soil and the dark burning debris radiated heat and then the wind picked up slowly. Out of what was smoldering and smoking emerged active orange flames, burning, reaching back against the wind to patches of fuel, flaming, reaching. The fire was going to cross the break and there was still only me watching. And then just as the fire crossed and orange flame burst out in a clump of grass in the unburnt side a team of firefighters arrived and doused the flame. If they had been a minute later they would have been too late. But this was just one spot on the mile-long line. After the fire-fighters arrived I went for a walk down the fire-break. Rounding a corner down the line I saw a brown column of smoke and the roar of a wildfire at full-bore. We had lost the line again after all. I turned and walked quickly back to my truck, hearing the roar of the fire following me. I told the fire-fighters what I had seen and evacuated behind the next fire break line. Before long, red flames were shooting into the sky very impressively and we had lost another thirty acres. Finally, late on the third day, we got the only help that mattered, the thing that we could not ask for or requisition: a misting, then a very light drenching of rain. It was not enough to put out the fires but it was enough to dampen the hot dirt and the hot air and discourage the fire from its willful spread. On the fourth morning the wind did not pick up and the fire-fighters could get a handle on the fire. Late on this, the fourth day, more rain came. I’m pretty sure that it is over this time. What did I learn there with the fire? That if you want to fight a range fire with any hope of success you need to know a lot of things, such as the wind pattern for that area and the kind of vegetation there. That timing is everything: you need to be able to think 12 hours ahead and at the same time be ready to change and react instant by instant as the wind, the humidity, the terrain that the fire is on changes. That you will probably not be able to beat the fire no matter what you do because when it starts burning it just wants to keep burning. And that the world when it is burning is a very different place from when it isn’t.